We often describe things, good or bad, in terms of what they are not. For example, this morning I ran into an old friend and asked him how he was feeling. He answered, “No complaints.” Now, what does that mean? Does it mean he has a list of complaints taped on his bedroom wall that he reads every morning to see if he has anything to complain about? Pay attention to how your friends and colleagues talk. You will find that many speak a language of exclusion, a language about “what is not,” instead of “what is” or “what can be.” You give an idea to your supervisor at work and you hear, “Not bad.” Does that mean every other idea you offered was bad? You suggest that you implement a new plan or idea and you hear, “It won’t hurt.” Does that mean that everything else you implemented did hurt? How many times have you heard a friend say to you something like, “Why don’t we get together for lunch?” What’s interesting is that when someone asks another person “Why don’t we,” the receiver frequently replies with some type of “no.” When someone says, “Why don’t we…?” our first unconscious impulse may be to begin to think of reasons why not to get together. The phrasing creates ambivalence. However, if you were to change the question to “How about getting together on Monday?” or “Let’s get together on Monday,” the ambivalence would disappear. Because most adults focus on deficiencies, they phrase some of their thoughts and ideas with negatives such as no, never, don’t, and not. As you read this, you might be thinking, “I never would have thought of that” or “Not a bad insight.” Rephrase your thought to “This is the first time I ever thought about that.” Or “That’s an exciting insight that could explain a lot.” Notice how the switch from “what is not” to “what is” affects your perception of the information. You now feel interest, curiosity, surprise, and even fascination. You can feel your consciousness expand. Suppose you go to Disneyland with your family, and you have a wonderful time. I come up to you and ask, “How did you like Disneyland?” If your response is “Not bad,” that description of what is not may come across in a cool monotone barren of enthusiasm. But what if you say, “Great”? Notice that there is a difference in volume, in affect, in intonation — in the whole feeling associated with the word great. Your volume goes up. Your mouth gets more relaxed. Your thoughts and feelings are different when you talk about what’s there, as opposed to what’s missing. By changing your language and speaking patterns in a positive way, so that they are about “what’s there,” you guarantee a feeling of optimism and real output in performance. What you say affects how you feel. How you feel affects how you think, and vice versa. All language, feelings, and thoughts interact with each other, and the entire accumulation of those influences creates your output and behavior. Thought is not different from emotion. Suppose a friend keeps you waiting for two hours. You can get angry, thinking, “What does he mean, treating me like this? He has no concern, no consideration for me. He’s always treating me badly,” and so on. By thinking in this way, you get very angry. Then, when he arrives and explains that he was late because of an accident that held up traffic, the anger dissipates. This shows that the emotion was influenced by thought. If you change your thought, the anger fades. If you change one element — your language — your thoughts and feelings will be changed as well. The cumulative impact will be new patterns of output and behavior. This is where you can make a conscious decision to become a positive-thinking person by creating positive speaking patterns. Once I stayed at the storied Ritz-Carlton in Montreal. Usually I don’t like staying in expensive hotels. Yet in the Ritz I felt great. I discussed my feelings with the manager, and he told me his secret. He told me that the most significant factor for their success was training their employees to frame everything they say in a positive manner. For example, employees who perform services for you will say, “It’s a pleasure,” instead of something like “No problem,” when you thank them. Or “Our restaurant would be pleased to serve you tonight,” instead of “Why don’t you visit our restaurant?” Guests feel welcome and appreciated, and find themselves feeling happy and positive. By the end of my stay, I was framing everything I had to say in a positive way. The Ritz-Carlton experience demonstrates how language allows us to influence ourselves and others in a particular way — we can transfer our own mental state to another’s mind. Starting any behavior pattern is easier than stopping one. It’s easier to concentrate on starting to breathe clean air, starting to eat more healthy foods, starting to learn to relax, starting to hit the golf ball down the fairway, and starting to be more upbeat by changing your speaking patterns. Stripping negatives from your speech pattern and speaking about “what is,” instead of “what is not,” will, over time, cultivate a positive attitude and change your perspective on your work and, indeed, on life itself. 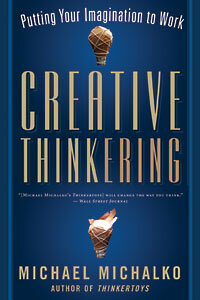 Michael Michalko is the author of Creative Thinkering, Thinkertoys, Cracking Creativity, and ThinkPak. While an army officer, he organized a team of NATO intelligence specialists and international academics to find the best inventive thinking method. He has expanded and taught these techniques to numerous Fortune 500 companies and organizations. He lives in Rochester, New York. Visit him online at http://www.CreativeThinking.net.